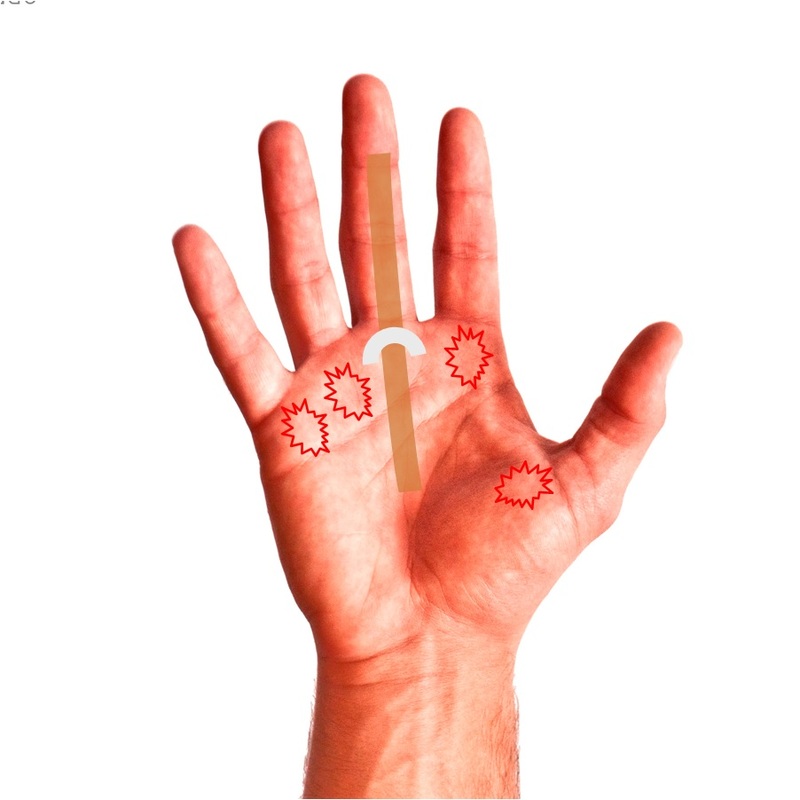 ‘Trigger Finger’ is a form of tendon entrapment, a common cause of hand and wrist pain. Pain may develop following a minor injury, over-use, or with no apparent cause. The pain may limit motion and cause apparent weakness. The problem occurs when the tendon that bends one of the fingers is entrapped, causing the finger to catch, ‘trigger’, or get stuck in place. The attached image shows the actually area where triggering happens (stars). Tendons (brown) naturally go through a sheath made of a series of pulleys that hold them in place. The first one, (illustrated in white) is in the palm. Normally, the tendons glide smoothly through the pulley with no effort. When the pulley gets thick, the tendon will have less room to go through and gets trapped as it goes across. A knot may sometimes be felt in this area. This is one of the most common conditions of the hand. Although sometimes referred to as tendinitis, the tendon itself is rarely involved. The goal of treatment is to reduce pain and restore function. In the vast majority of cases, nonsurgical treatment is successful. The idea is to calm down the inflammation and make more room for the tendon to glide smoothly through its sheath. I usually try an injection to achieve that goal. Steroid injections are usually very effective and usually show effect within a week. If this fail, surgical release of the sheath lifts off the entrapment and allows to tendon to glide freely. Depending on which tendon is involved, the procedure can be done in office or as an outpatient, under local anesthesia. Recovery is usually very quick, and I usually allow immediate use as long as the dressing is left on full time until seen later in the office.